Imagine this unlikely caper. A cartel of 30 organised criminals manage to all get jobs at The Bank Of England with access to the vaults, co-incidentally, on the day Nelson Mandela became President of South Africa. Every single day each of them manages to smuggle out a gold ingot in their handbag, briefcase, gym bag or greatcoat. The security staff at the door are in on it too so they get away with this – stealing 30 gold bars between them every single working day of the year. Some of them are now reaching retirement and will have to fall out of the caper. They will not have managed to steal the equivalent amount of money stolen by crooked ANC government officials in South Africa during the five years of Jacob Zuma’s presidency. The theft of State assets amounted to R1.5-trillion (about £80 billion). One of the hardest hit sectors is the electricity supply, which is run by a state-controlled company, Eskom. Mismanagement and looting have left Eskom billions of Rand in debt. It owes more than the country’s healthcare budget. The power utility company is on the verge of bankruptcy with debt in excess of R600 billion (£32 billion). 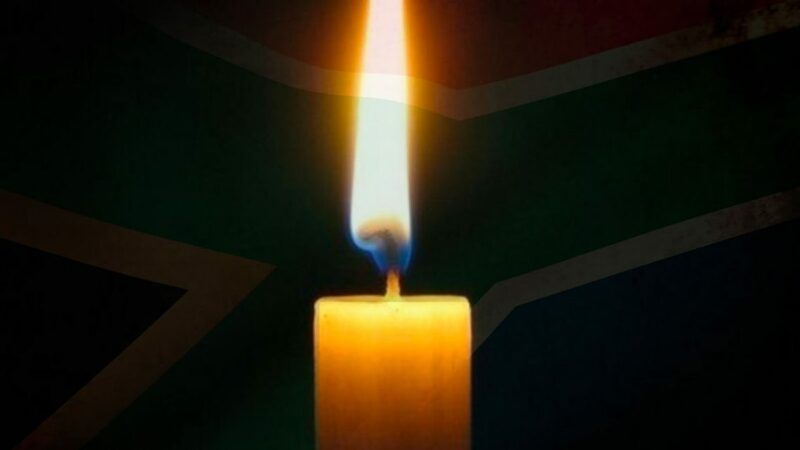 As a consequence it has had to resort to a measure called “load shedding” in which it cuts the power to whole suburbs – sometimes whole cities – for hours at a time, every day, in order to ration the power it is able to generate. Because it has no money to repair its infrastructure, these planned power cuts are interleaved with blackouts due to equipment failure. Unsurprisingly, it is costing the economy billions more as businesses and shops are unable to function without reliable electricity. Those who can afford it have installed backup diesel generators and solar panels to service domestic homes and businesses during the power outages. Others resort to candles and gas, or wait it out in the dark. To add to the woes, the increasingly desperate-for-revenue Eskom is puantively cutting power to towns whose municipalities have collected rates and taxes to cover electrical supply from residents, but failed to pay it over to Eskom. Citizens have paid for power they are not receiving but are powerless to do anything about it not being delivered. As a technologically advanced society, local tech companies have produced iPhone apps which allow people to know when scheduled power cuts (or ‘load shedding’) will occur. There is no need to be in the dark about when you’ll be left in the dark. For some towns it gets worse. The small university town of Grahamstown – now renamed Makhanda – has been without reliable running water for several months because of broken down water processing equipment and vandalism to pumps exacerbated by drought. The (largely residential) university has had, on a number of occasions, to consider sending students home because there hasn’t been running water on campus, leading to blocked toilets, unavailability of showers, and inability to run the kitchens in the halls of residence. Meanwhile charities are trucking water in to distribute in bottles. The suffering doesn’t end there. A bank set up as a “black empowerment” scheme – VBS – has been looted to the tune of R2 Billion (over £100 million) leaving elderly people queuing up outside hoping to salvage some of their pension or savings. Many of these folk have lived without electricity their whole lives so the Eskom fiasco has not affected them as acutely, but they have found themselves disempowered and left powerless in an entirely different way by a government which was supposed to secure their freedom. Instead it freely stole from them and secured nothing.